it takes a lot more than luck to succeed at almost anything, from winning high office to making millions of dollars to painting a masterpiece to building a house to cutting hair properly. To denigrate the rich and famous by calling them lucky is to denigrate every person who strives, with some success, to overmaster whatever bad luck happens to come his way. Here is more evidence to the same effect. Two days ago, a young pitcher for the Chicago White Sox named Philip Humber threw a perfect game against the Seattle Mariners. Humber’s was the 19th perfect game since 1893, when the distance from the pitcher’s plate (rubber) to the back point of home plate (where the foul lines intersect) was increased to 60 feet, 6 inches. The 19 perfect games were pitched by 19 different men. And the total number of major league games played from 1893 through today numbers well above 300,000, which means that the potential number of perfect games (if thrown by both teams’ pitchers) is well above 600,000. Aha, you might say, a perfect game is a matter of luck. Well, it may be partly a matter of luck, but baseball (despite some elements of randomness) is a game of skill, applied intentionally. A perfect game, like many other aspects of baseball, is the residue of the applied skills of pitchers and fielders, just as (the prevalent) imperfect game is the residue of the applied skills of batters and base runners. * Through April 22, 2012. A bit of unpredictability (or “luck”) here and there does not make for a random universe, random lives, or random markets. If a bit of unpredictability here and there dominated our actions, we wouldn’t be here to talk about randomness…. In baseball, as in life, “luck” is mainly an excuse and rarely an explanation…. For reasons I outlined in “The Price of Government,” the post-Civil War boom of 1866-1907 finally gave way to the onslaught of Progressivism. Real GDP grew at the rate of 4.3 percent annually during the post-Civil War boom; it has since grown at an annual rate of 3.3 percent. The difference between the two rates of growth, compounded over a century, is the difference between $13 trillion (2009’s GDP in 2005 dollars) and $41 trillion (2009’s potential GDP in 2005 dollars). may seem incredible, but scan the lists here and you will find even greater cross-national disparities in per capita GDP. Go here and you will find that real, per capita GDP in 1790 was only 4.6 percent of the value it had attained 218 years later. Our present level of output seems incredible to citizens of impoverished nations, and it would seem no less incredible to an American of 1790. In sum, vast disparities can and do exist, across nations and time. One of the ostensible reasons for governmental intervention is to foster economic stability. That was an important rationale for the creation of the Federal Reserve System; it was an implicit rationale for Social Security, which moves income to those who are more likely to spend it; and it remains a key rationale for so-called counter-cyclical spending (i.e., “fiscal policy”) and the onerous regulation of financial institutions. Has the quest for stability succeeded? 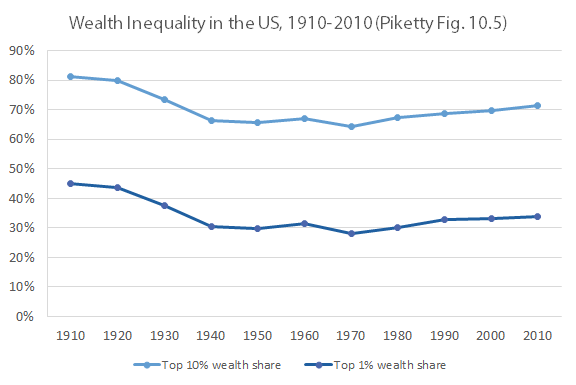 If you disregard the Great Depression, and several deep recessions (including the present one), it has. But the price has been high. 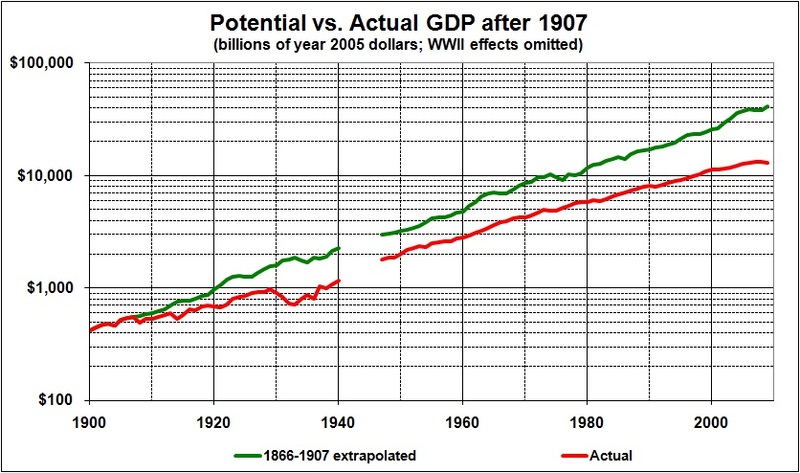 The green line in the following graph traces real GDP as it would have been had economic growth after 1907 followed the same path as it did in 1866-1907, with all of the ups and down in that era of relatively unregulated “instability.” The red line, which diverges from the green one after 1907, traces real GDP as it has been since government took over the task of ensuring stable prosperity. What about those fairly sharp downturns along the green line? If it really is important for government to shield us from economic shocks, there are much better ways of getting the job done that they ways now employed. There was no federal income tax during the post-Civil War boom (one of the reasons for the boom). Suppose that in the early 1900s the federal government had been allowed to impose a small, constitutionally limited income tax of, say, 0.5 percent on gross personal incomes over a certain level, measured in constant dollars (with an explicit ban on exemptions, deductions, and other adjustments, to keep it simple and keep interest groups from enriching themselves at the expense of others). Suppose, further, that the proceeds from the tax had a constitutionally limited use: the payment of unemployment benefits for a constitutionally limited time whenever real GDP declined from quarter to quarter. Perhaps that’s too much clutter for devotees of constitutional simplicity. But wouldn’t the results have been worth the clutter? The primary result would have been growth at a rate close to that of 1866-1907, but with some of the wrinkles ironed out. The secondary result — and an equally important one — would have been the diminution (if not the elimination) of the “need” for governmental intervention in our affairs.